At Grand Haven Dental Care we appreciate the opportunity to provide you with the best value dental services and want to make sure you receive top rated service the moment you walk through our doors. 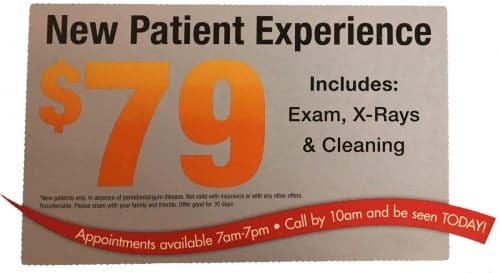 New patients are always welcome and now it is more convenient than ever with our New Patient Special. If you have questions about the limitations of this offer please feel free to contact our friendly office anytime at (616) 847-0900. During the Chao Pinhole® Surgical Technique, a needle is used to make a small hole in the patient’s existing gum tissue. Through this pinhole, special instruments are used to gently loosen the gum tissue. These tools help expand and slide the gumline to cover the exposed root structure. There are no grafts, no sutures, and no incisions needed with the Chao Pinhole® Surgical Technique. It simply involves the adjustment of the existing tissue. At Grand Haven Dental Care, our team is enthusiastic about providing expert dental work as well as making sure our patients have a healthy foundation for perfect oral hygiene. Our well-trained staff is dedicated to ensuring our high standards are met with every patient who walks in the door. Your comfort is our priority! For over 29 years, Grand Haven Dental Care has been treating families from Grand Haven, Spring Lake, Nunica, Ferrysburg, West Olive and other nearby communities with the best oral care around. Our cutting edge technology allows us to better serve our patients with the utmost precision and efficiency. Call (616) 847-0900 today to schedule an appointment for a time that works for you. I'm from out of town, called the same day they got me in. Fixed my absiss that I should have taken care of days ago. They took excellent care of me, all the staff was courteous and fun-loving people. I would not hesitate or give a second thought of another facility, highly recommend Grand Haven Dental Care!!! We offer emergency phone consultations to our existing patients. Call us anytime at (616) 847-0900.